There is a very important set of messages that has been proclaimed to the world since the 1800's. And we find these messages in Revelation 14. These messages are of so great importance that they are shown as being proclaimed with 'LOUD VOICES'. Sadly today, the majority of churches have turned away and rejected these messages and have become the very thing that these messages warns about - "FALLEN BABYLON". Not only that, the very church in which God chose to give these messages to the world, the Seventh-day Adventist Church, has now itself rejected the foundation of this end time warning, and that is to worship the one true God. The whole world, including the Seventh-day Adventist Church, has been deceived into worshipping the false trinity god of Babylon. So on this page, we are going to show that the very foundation of the three angels messages is the call to turn to the one true God of the Bible. IMPORTANT NOTE: Before we begin going through the three angels' messages. Let us make a note of something important. In Revelation 14:1 it says that the 'special group' of end time saints, the 144,000 are those who have the FATHER'S name written in their foreheads. Why do they specifically have the Father's name? Keep that in your mind as we go through the three angel's messages. This first message is a call to worship the one true God. But who is 'HE' which is to be worshipped? Is this the trinity god that is worshipped by the world's churches today? Well, this message seems to be pointing to a singular God, saying 'Him' and 'His'. Let's take a look at the rest of the Bible to see if we can find out who this God is. This is very interesting. Jesus tells the Samaritan woman that she knows NOT who she worships. But 'we', Jesus says, speaking of the Jews KNOW who we worship. And who was it whom Jesus says is the 'God' who is to be worshipped? A trinity '3 in 1' god? No, THE FATHER. And what about the Jews? Did they worship a trinity god? Because Jesus said that the Jews knew who they worshipped. Let's take a look at a conversation between Jesus and a Jewish scribe to confirm this. So who is the judge of all? It is God. And who is God according to Jesus and the apostles? It is God the Father. And God the Father judges the world THROUGH Jesus Christ His Son. To whom God has committed and given authority to judge the world (John 5:27). For Christ is the Mediator between God and man. So who is the God whom the first angel's message is calling us to worship? Who is the Creator and 'Lord of heaven and earth'? It is clearly God the Father. And He created all things through His very own Son, Jesus Christ. 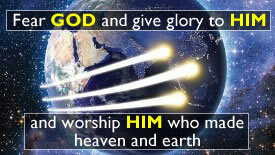 God the Father is clearly the 'HIM' who the first angel is warning the world to worship, not some '3 in 1' trinity god. And this is exactly what Babylon has done through the trinity god teaching. She has deceived the churches into 'DENYING the ONLY LORD GOD', which Jesus Himself confirmed in John 17:3 was His Father. And has deceived the churches into replacing God the Father with a '3 in 1' trinity god that the Bible never speaks of. Not only that, the Roman Catholic Church has deceived the various churches into denying Christ as the literal Son of God. Yes, the Roman Catholic Church has deceived the various denominations with the false Sabbath (Sunday). But she has also deceived the denominations with an even greater deception. And that is getting them to worship a false god! The trinity teaching did not originate from the scriptures, but rather from early church bishops, during the 3rd and 4th century, who were steeped in Greek and Platonic philosophy. And now virtually the whole world has been made drunk with Babylon's wine. Revelation 13 also warns us about the mark OR name OR number of the beast. And this is something that many people miss. So many professed Christians are just focused on the MARK of the beast, that they forget we can also be deceived by the 'name OR number' of the beast too. Now we have another page dealing with this, so please take a look at our page - mark OR name OR number of the beast for more information. Now the last verse of the third angel's message is very interesting. It tells us that the saints, the one's who are not deceived by Babylon and the beast, are the one's 'keeping the commandments of God AND the faith of Jesus.' Remember the 144,000 earlier in Revelation 14 have the FATHER'S name in their foreheads? Well, these are the one's in the very last days keeping God's commandments and the faith of Jesus. And what is the very first commandment? So we are to have no other 'gods' (PLURAL) before 'Me' (SINGULAR). We have already established that the Father is the one true God. So who is the 'ME' in the first commandment? It is God the Father. He is that 'singular' God whom the world is to worship. But what does the trinity god teaching do? It replaces God the Father, a singular God, with a PLURAL '3 in 1' god, which the first commandment tells us not to do. So who are the one's keeping the commandments of God? It is those who believe in and worship the one true God, the Father. 'Oh but the trinity does not deny the Father and Son'. I'm afraid it does my friend. If you actually look at the trinity teaching, you will see that it says Jesus never had a beginning and has always existed alongside the other two beings. And what does this mean? It means that according to the trinity teaching, Jesus CANNOT be the real Son of God. And if you look at our IS JESUS THE LITERAL SON OF GOD page, you will see an official quote from the Seventh-day Adventist Church saying that Jesus is NOT the real Son of God! And according to 1 John 2 above, this is ANTICHRIST! A teaching direct from that 'antichrist' church, the Roman Catholic Church. Sadly today, we have church leaders saying that the Father and Son truth has nothing to do with the three angels' messages, and they fail to realize that this is the very foundation of these messages. And worshipping the one true God is also the foundation to keeping the commandments of God and the faith of Jesus. Remember, the saints, as confirmed in Revelation 14:1 are sealed with THE FATHER'S NAME in their foreheads. Signifying that they are the one's worshipping 'the only true God' (John 17:3), 'the only Lord God' (Jude 1:4), the 'one God - THE FATHER' (1 Corinthians 8:6). The trinity is a false god friend, and it is being used in this ecumenical movement to unite the different church bodies into Babylon, to be led by that 'mother', the Roman Catholic Church. Please study this for yourself. Pray and ask God to open your eyes to this. If you are thinking, 'where is the Holy Spirit', then please see our page - WHAT IS THE HOLY SPIRIT?